Good morning Friday - how I welcome you! Today, I'm sharing some flowers from my part of the world. I am only just getting over the fact that flowers in Brisbane are expensive...incredibly expensive. A few years ago back in cold North Yorkshire, I would think nothing of picking up a pretty bunch of flowers during my grocery trip to the market or the supermarket. The colourful blooms would brighten up our house most weeks. Until quite recently, flowers have been a special occasion treat here. Then two things happened- one, we discovered a local farmers market and two, we realised that we were allowed to pick flowers from our own garden!! So during the last few months I have had an impressive arrangement in a tall glass vase that greets me in my living room. It's a constant reminder of my location - these kinds of flowers are so different. I am going to dedicate my flowers today to anyone reading who is living away from their home country. I hope you can appreciate and enjoy the differences in your new place. A week or so ago I was given a blog award....a 'liebster award' is an award for new blogs that someone out there thinks should be shared. It was passed on to me by Linda who writes Flowers on my table. Linda lives in Ireland and is a florist and a decorative artist and through her gorgeous blog we have discovered that we once lived in the same small town - now that's proof how small this world really is. Anyway, Linda asked me to pass on the 'liebster award' to other blogs that I read that I think should be shared. I would like to pass it on to a talented writer who pens I love books...and other thought on life. Sian lives in Spain with her family and is a teacher (I would love to be in her class). She writes about the Spanish way of life, the books that she loves to read and about the loves and challenges of parenting. So go and say hi to Linda and Sian, and with a quick link you'll find yourself in Ireland and Spain - enjoy! 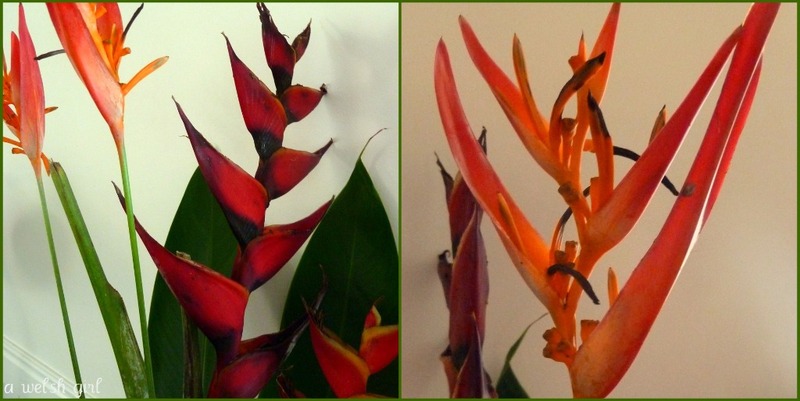 They are heliconias yes!! In Darwin these are available every weekend in abundance and very cheap. I love that they have such longevity, and what a striking arrangement. I love the flowers, reminds me so much of Brisbane. I'm also following Sian, thanks for the link, and congratulations on your award too! congrats on the award! love the helliconias - i think that's what they are..
Im Irish born, married to a Welsh man, living in Australia and with a daughter named Sian. I love flowers too and when I lived in England I often used to bring a £5 bunch of flowers home from Tesco. The first time I tried to buy a bunch of flowers for a friend here in Australia I was charged $30 and nearly died! 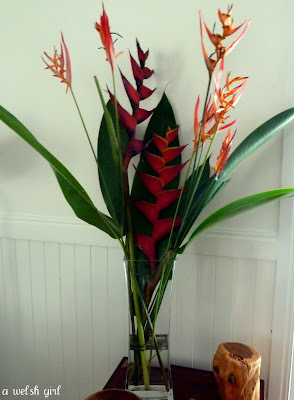 I love your tropical flowers and the fact that they came from your garden. Bonus! I'm looking forward to reading the two blogs you recommended here. Have a lovely weekend! I don't know what those flowers are called either, but they are gorgeous! Congrats on the award!